The Wild Ride of Infertility, Pregnancy, Parenting, and All of Life's Little IFs. Every mother I know dreads the moment when she is forced to decide if she should put her kid into daycare or not. Sometimes you have no other choice and the decision is taken out of your hands, but sometimes, you have more than one option, and then it becomes a mind game as to what the best choice may be. PRO – Socialization – There is no denying it, kids in daycare tend to be far above other kids in terms of socialization. Whether if they have siblings or not, they quickly learn the basics of how to get along with others; not being able to have alone time whenever they want it; learning to share; learning how to play, talk, and get along with others. They learn to overcome shyness and quickly develop bonds and a group of friends. CON – And this is the biggie con: Sick. Often. – Especially if you need to start them in daycare young, their little immune systems just are not completely developed yet. And the fact that they are stuck in 1 room with 10+ other kids all day – regardless of how clean the teachers manage to keep it – they will get sick. And chances are, so will you. “Daycare Diseases” as I call them are not the same as what you experience day-to-day in the adult work world. There will be some things your little one will get that you won’t, but be prepared for the whole family to get sick as well. The other big con aspect for this one is that since your child will often get sick, you’ll often have to take sick days to stay home with him/her unless you can make other arrangements. It’s center policy as well as state requirement that your child can not attend school with anything more than a cold. Watching your child constantly get sick is one of the hardest things a parent can do, but that said, your child will get sick regardless of being in daycare or not. If it doesn’t happen now, it will happen when they go to school unless you are able to expose them slowly to things in controlled situations. 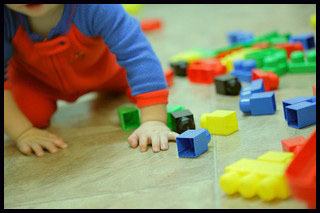 PRO – Projects – If you pick the right center, your child will be exposed to lots of activities and projects. Not only will they help developmentally, but they will also look so cute on the refrigerator! PRO – Exposure to other adults – This exposure to a variety of adults will help your child open up and learn how to accept and socialize with adults and authority figures too. CON – Bad habits – Obviously, not everyone is going to raise their kids the way you do, so your child will likely pick up some bad habits to go along with the good things they learn. Be prepared to have to stay on top of your kid to try to nip some of these new habits in the bud! CON – More laundry – As if that laundry pile wasn’t big enough, be prepared to get more. There’s something about daycare that means extra dirty clothes! CON – Turnover – While many centers try to keep your child’s environment as stable as possible, be prepared to see lots of change with the teachers. Early childhood teachers are grossly underpaid and work in a fairly stressful environment, so there is often a high turnover rate among daycare teachers. And although there are state regs as to the requirements a teacher needs to work in a daycare, they are likely going to be lower than your requirements. If you want a teacher with credits out the wazoo, you better start looking into private school. PRO/CON – State Regs – Daycare centers have a list of regulations they need to adhere to (some states more than others). This is a good thing because you can be sure that there are safety precautions in place (as long as the center consistently complies). This can also sometimes be a con if there are certain regulations (or paperwork) that you don’t want to deal with. The center has to follow these regulations or they risk closure, so their hands are tied. PRO – School Life – Your child will already be used to “school life”, so the transition into kindergarten and elementary school will be much easier. PRO – “I’m a big kid now!” – Being able to say, “I’m in school” enhances the “big kid” status. Having the confidence of being a “big kid” helps the child have confidence to do other big kid things like potty training, etc. PRO/CON – Potty training – If your kid starts daycare while still in diapers, potty training at school can be both a good and bad thing. Sometimes the extra help and reinforcement from other adults is nice. But sometimes it can confuse matters if the school is not able to use the same methods you prefer to use, and/or if your child only goes to daycare part-time. Be prepared that in some cases, the potty training process may take a little longer. CON – Overstimulation – If your child needs to go for a full day, it can sometimes lead to overstimulation. As you can imagine, one room with 10 toddlers can get to be a bit much. Even when everyone is calm and things are good to go, there’s just always something going on. There is always some kind of noise, something to see, do, etc. It can be a long day. Expect your child to sometimes be “buzzing” when they get home. Be prepared to create a calm atmosphere to come home to if possible so they can have a chance to try to unwind a bit before bedtime. And on the days not at daycare, try to provide calmer, quieter things for your child to do so their already-stimulated-just-from-development senses have a chance to take a little break so their brains can focus on different things. It will also give their brains a chance to learn to focus on just one thing at a time instead of always having multiple things going on at once. PRO – Ability to observe older kids – This is especially great if you only have the one child at home. Younger children often like to watch their older siblings and tend to develop quicker because of it. But if your child is the oldest (or only), they do not get that chance at home. Daycare allows them to see what other kids are doing as an example of what they can strive for. CON – Rules – The guidance and/or limitations at school may be different from what is expected at home. Be prepared to try to meld the two world together for your child and help them understand the different rules for both at home and at school. PRO – Learning that Mommy/Daddy always come back – As hard as it is to let go of our kids, going to school offers the very good benefit of teaching your kids that they can always trust you to come back. They learn that it’s ok to be away from Mom/Dad and to explore and have fun because they will always come back. As much as it kills us parents, it’s a good developmental milestone. CON – The Arts – Depending on your school, your kid might not be exposed to enough of “Arts” activities. If music and dance, etc. are important to you while your child is little, be sure to check into what the various centers in your area offer. If they do not offer enough Arts curriculum, you may need to consider enrolling your kid in a weekend Mommy & Me kind of class to fulfill that requirement. PRO/CON – Price – Daycare is very expensive. You also need to factor in additional money for extra doctor visits, medications, and time off of work. If price is a concern, and you have the ability to stay home with your child, then daycare may not be the right route for you. However, it also tends to be cheaper than a private nanny, so if you have to leave your child with someone, then daycare will be a cheaper option than private care. As with anything, there are obviously many pros/cons to consider. When making your decision, you’ll need to weigh out what is more important for your family’s needs. And if you don’t really have options, then don’t despair. There are ways to combat many of these cons on this list. If you’re aware of them ahead of time, then you can be prepared to do what you need to in order to make this a good experience for everyone all around. There are also many pros to daycare, so try to focus on these – that’s what your child will remember in the long run anyway! A friend of mine shared a link to this article on Facebook this morning, and I was instantly appalled. (Although, sadly, not surprised.) Aspartame in milk? Seriously?!? 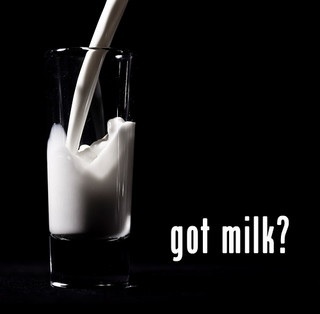 Aspartame in milk and 17 other dairy products…. The best part is this petition is not only asking to do this, but asking to do this without having to put it on the label! They’re trying to say that the aspartame would provide for a lower calorie product and would “promote more healthful eating practices and reduce childhood obesity.” What?! Last I heard, aspartame actually contributed to obesity and diabetes and puts us at risk for certain cancers and other fun disorders. Not to mention, many people’s systems can not tolerate it very well. So what’s the real story here? That’s what I call conflicting information! I’m outraged that the FDA is even considering this. I’ve been frustrated with all the horrible things I’ve been reading about our food lately anyway, and this just set me off. Why is it so hard to be able to affordably provide our families with healthy, natural foods? I do not want my kid drinking any milk with aspartame in it, not to mention myself. If this ridiculous proposal does go through, I certainly hope they will be required to put it on the label. It should be illegal not to given all the health problems associated with aspartame and other artificial sweeteners. KEEP THESE CRAPPY CHEMICALS OUT OF OUR KIDS’ FOOD! This article was originally published at Silverpen Productions, LLC. It was one of every parents’ nightmares – my little girl was in the hospital, looking so tiny and helpless in that huge bed, hooked up to an IV and oxygen. How did we go from my crazy, nonstop kid to this in just a matter of days?? After a week of being sick, 2 doctor visits, and a day sitting in the ER, we finally learned that she had RSV – Respiratory Syncytial (sin-SISH-ul) Virus. And not only was it going around, this year, it was going around with a vengeance. Basically, RSV is an infection of the lungs and breathing passages. Everyone gets it. Most people will get it at least once a year. In healthy adults, it just presents as a bad cold – stuffy nose, cough, mild fever. But for young children (as well as the elderly), RSV can turn into a major respiratory illness. The most frequent cause of lung infection in infants and young children, RSV usually lasts 5-15 days. The child’s airways will become inflamed and swell, the muscles around them will tighten and they will often fill with mucus, dead tissue, and fluid. RSV occurs in epidemics and peak season is typically November – April in the US. Virtually all children will have been infected by RSV at least once by the time they are 3 years old. Most children can be treated at home, but higher risk babies and those who have it morph into a severe lower respiratory infection may need additional support. These are signs that the illness has progressed to the lower respiratory track and is likely turning into bronchiolitis or pneumonia. They are also signs that your child is becoming dehydrated, not getting in enough oxygen, and needs additional support measures at the hospital, since both of these conditions can rapidly turn into much more serious problems in young children. Unfortunately, this is a nasty virus that kids can (and probably will) get again and again. But if we as parents are aware of what to look for and what we can do to help, hopefully we can protect our littlest ones as much as possible. At least Spring is almost here and this terrible bug season is winding down. Hopefully next year won’t be as nasty! Join Silverpen Productions on Facebook! Hey Moms – Ever Hear of Diastasis? More Sunshine = More Babies? ?